Announcing: Audiobook Week, June 21-25th! So, you may know that June is National Audiobook Month. You may also know that I love audiobooks. Or, actually, you may not. See, I’m really, really bad at reviewing my audiobooks, as compared to paper books. The main reason for this is that I almost always get my audiobooks from the library and almost never are they sent to me for review. Since I give preference to reviewing the books people actually send me, if I get lazy about reviewing, audiobooks often fall to the wayside. But here’s the thing, I LOVE audiobooks. Love them. They make my commutes more pleasurable, and cleaning and working out too. They also allow me to maximize my reading time, and squeeze in books I wouldn’t otherwise have had a chance to read. 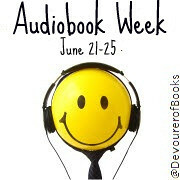 Because I love audiobooks, and I just don’t tell them (or you) enough, I want to spend a week celebrating them! The week of June 21st will be all audiobooks, all week. I will be reviewing five audiobooks, and am planning a few other special things as well. And you can join in! You don’t even need to sign up ahead of time! I’ll have a Mr. Linky up for all of your audiobook reviews, but I’ll also have some suggested topics for different days that I will announce a little closer to the event (but plenty early enough for you to get your posts written, if you so desire). Audiobook professionals: If you are interested in contributing a guest post for this event, I would be happy to match you up with someone who is planning to participate. 46 comments to Announcing: Audiobook Week, June 21-25th! Very cool! I started doing Audio Book Thursdays and I was planning to do some fun stuff for June’s celebration, so I’ll definitely join in! I really want to get into audiobooks, because I think they would be convenient especially for the gym. But I’ve always had a hard time. I just got the new Emily Giffin book as an audio though, so I’m hoping that will help me break in! I just saw this, but I had to comment. The new Emily Giffin is narrated by Cynthia Nixon and she did a great job! I thought all I would hear when I listened to her reading was Miranda from SATC but Cynthia really became the characters. I love audio books, but it was a learning process. I’ve learned I don’t listen very well in the car, but while I’m doing housework I’m pretty focused on the book. I hope it will work out for me to participate that week. It would be a great chance to do a super deep cleaning in my house! Awesome!! I’d been debating doing something like this, but didn’t have the willpower; I’m so glad you’re doing it! I’m in! I’ve been listening to a TON of audiobooks this year. Sounds like fun–I’m in. I love audio books for the same reasons and they are doing so much better with the narration lately. Asking me to review an audio book that week is like asking me to take a shower that week! I didn’t keep track last year, but I would bet that at least half of the books I read a year (over a hundred) are audios…nearly all from the library. I would shrivel up and die without them! I was planning to honor Audiobook month by “reading” a bunch of audio books, so please count me in. I’m hoping to get at least 3 or 4 done, If I’m lucky even more! So glad you’ll be doing your very own week dedication! I’m really excited about the authors participating in the Audiobook Month Initiative – I’m really new to the world of audiobooks, and total immersion for the month of June is going to be an awesome way to find new authors, narrators, and *books*! You know I’m in on this!!!!! Oh, this sounds great. I haven’t read many audiobooks yet, but I’m hoping to learn more. Your week sounds like a good starting point. Oooh–I didn’t know this. I absolutely LOVE audiobooks too! I listen to one or two a month, and almost always have one in progress. How the H did I miss this post? I’m so in. I have several audio book reviews that I haven’t written yet and you’re giving me the perfect excuse to hold off a little longer on writing those. LOL! Sounds like fun! I’d love to be involved. I have some audio book reviews to write too. BTW: if are still looking for hosts for guest posts, I’d be happy to do that. I’m in Jen – I listen to just about a book a week these days. I’m just reading this so the timing is perfect… I didn’t miss it! I am definitely in – love audiobooks for the weekly drives to/from CT and my walks to work. Thanks for hosting! Count us in! This will be a nice thing to highlight when we post our roundup July 1, for sure. I love audiobooks, and with an hour long commute each way, they make my ride way less lonely. Sounds like a great idea! Looking forward to Audiobook Week! Jen, this event is right on time. I just finished my first audiobook this morning. I happened across your post after I had begun the book. I will probably post at least one of the topics you’ve scheduled. I can tell you put a lot of thought into this. Thanks. What an awesome idea. I purchase audios for the library I work at and love to listen to mostly fiction and suspense on audio. Right now I am listening to Shanghai Girls by Lisa See. This is great I would like to participate! The Sunday Salon: Throwing a Bunch of Information at You to See What Sticks - my books. my life. Audio Book Week! « Literary A.D.D. Best Friends Forever [Book Review] - my books. my life. Suite Scarlett [Book Review] - my books. my life.